Both sides sheathed (first layer). 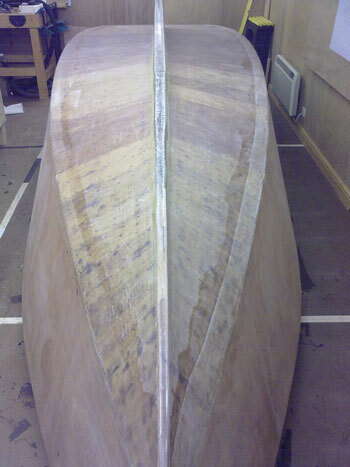 The finish on the starboard side was much better, no slumping. The trick is to be mean with the resin. Squeegy hard, especially the peel ply layer. 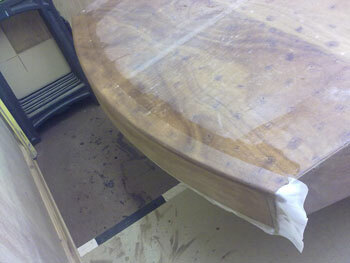 So minimal sanding will be required here, just the areas where the peel ply overlaps and the return on the hull bottom. I probably used ~200g less epoxy on this side. Finally I get the stern piece on. 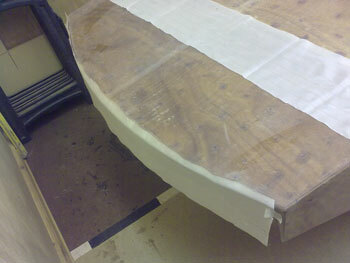 Shown here held in place with masking tape before the epxoy goes on. And here with it's peel ply covering.